Doing everything with quality increases your chances for success, enhances your reputation and saves you time in the long run. People typically equate quality with skill, but quality is a by product of time, thoughts and systems. I’ve posted 21 Ways To Do Everything BetterÂ at Dumb Little Man. Be sure to check it out. Please digg it if you think it’s worthy. In order to grow professionally you need to get good feedback and learn from it. 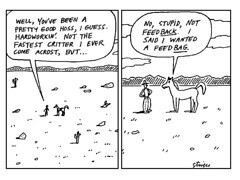 Most people who give feedback have alternate agendas. Your fellow employees may not see the full picture. Your family members may not even understand your industry. Even your customer may want something specific for free, besides you don’t want them thinking of you in a negative way. The best person to give you feedback is your former customers. They liked you enough to get started with you but then they disliked you enough to move on. Also they can compare you to someone else and have no reason not to be honest. Make it your point to touch base with them and ask “how can I do it better”? Make sure they don’t think it’s an attempt to win them back or they wont be genuine. When I get a notification that someone unsubscribes from the success machine mail list I always ask them if they can provide feedback to make my site better. This week I got my second one. So why did Jean unsubscribe? He switched to RSS because it’s more efficient (a great reason). And he also sent words of encouragement which I really appreciated. Thanks for the kind words Jean. You’re not going to please everyone so be sure that you evaluate their feedback objectively. Does it apply to you? Is it a very specific issue- that only applies to this former customer? Is that the niche your going for? Do you want to know the reason the first person unsubscribed? I want to know too! He never responded to my email. I’ll just assume he’s reading this on RSS also.